One of my latest treasures I’ve found are the classic theatrical productions in audiobook form produced by L.A. Theatre works. I’ve been listening to plays by Shakespeare, Arthur Miller, Chekov, Oscar Wilde and others. Listening to the classics is fun but this time around I was curious to see what LATW had to offer in the more modern theatre genre. 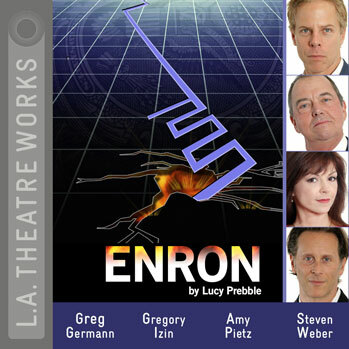 I was intrigued by this play, “Enron,” due to the fact that as the Enron scandal unraveled I was was working on a Business format radio station and at the time and this was all big news, and I heard most of it unfold live on the air with our in depth coverage on “Business Radio 1190 KPHN.” What I didn’t know then was how this would affect our economy today. This play not only points out the greed and political underhandedness of the time and of the company but also gives great insight as to how the world economy today has fallen into the state it is in. The interesting aspect of this play is that it, at times, takes an absurdist look at the situation and company. For example, when the company develops a way to make losses seem like profits they illustrate the feature by feeding dollar bills to Raptors, yes in the performance you hear actual dinosaurs eating money. The raptors soon become too much to handle and must be released or killed. Another fun feature of the play is that it has song and dance numbers. A musical about greed…too much. When Enron slumped into bankruptcy in December 2001, Lucy Prebble was a 20-year-old English literature student at the University of Sheffield in northern England. She tossed around the idea for a few years and eventually got to do her show making it into this musical adventure that actually puts into plain language the cryptic language of finances and Mark to Market financing that gave Enron the edge. So with a little British humor the average listener is able to understand the disaster that came crashing down on Enron and the U.S. Informative, entertaining and frustrating, you’ll find yourself laughing with disgust at big business.